An online community of Mopar Clubs and Organizations. Built to promote the Chrysler, Dodge, Plymouth, Jeep and Mopar related Club and organization members of the Mopar Enthusiast Ring. Types of sites include Mopar related clubs, forums, mailing lists, registries, organizations, webrings and more. Cruising the mopar club connection is a great way to connect to Mopar related Clubs and Organizations on the internet. Searching the Mopar Enthusiast Ring is a great way to locate member clubs & organizations or you can list all member clubs. Want to see your Mopar Club or related organization listed in the connection? Getting listed is as simple as becoming a member of the Mopar Enthusiast Ring. Joining the Mopar Enthusiast Ring is totally free and is a great way to to promote your club or organization site or page. For more information on joining visit the about the Mopar Enthusiast Ring section. By placing your club or organization in the Mopar Enthusiast Ring and adding the member link to your site, you will be joining one of the internets oldest and largest resources devoted to all things Mopar related. Are you a Mopar Or No Car Person? The Mopar Club Connection is an international organization with members around the world. We are a group of automobile enthusiasts with a common interest of preserving and enjoying our Chrysler, Dodge, Plymouth, Jeep and Mopar related vehicles. We are a virtual Mopar club, existing only online. Some of our members also have virtual Mopar clubs, while others are more traditional Mopar clubs that hold face-to-face meeting, Mopar car shows and races. Some of our members offer regional Mopar Clubs, some offer national Mopar Clubs and some offer international Mopar clubs and organizations. All of them are great places for a Mopar Or No Car person to hang out. 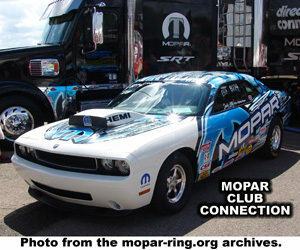 If the term Mopar is new to you or to find out more about our members hobby visit our What is Mopar ? page. The Mopar Enthusiast Ring Community comprises of three diverse sections for easy navigating. Mopar Club Sites, Business Sites and personal sites. Cruising the Mopar Enthusiast Ring is a great way to locate sites and pages devoted to Chrysler, Plymouth, Dodge RAM and Mopar related vehicles including the adopted brands AMC, Jeep, Eagle etc. The Mopar Club Connection is a valuable resource for locating clubs and organizations devoted to Mopar related vehicles & owners. The Mopar Ring Club Connection was built by Mopar Enthusiasts for Mopar Enthusiasts!